Asian qualifiers South Korea have revealed their new home shirt that they will wear during the 2010 World Cup in South Africa. The 2002 co-hosts qualified relatively comfortably from the Asian qualification section after winning four and drawing four matches to top their group ahead of rivals North Korea. The team have been drawn in a tricky qualification group alongside Argentina, Nigeria and Greece. They will hope to take advantage of Nigeria’s underachieving squad and Greece’s inexperience at this level to sneak 2nd place in the group. 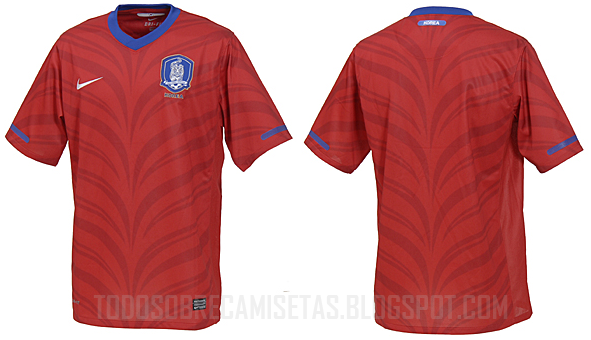 The new South Korea 2010 home shirt is predominately red with a darker red striped pattern running throughout the body. Manufacturers Nike place their white “tick” logo in the top right of the shirt whilst the national badge is situated opposite in the top left. Other details include a blue V neck collar and a small blue horizontal patch by the edge of the sleeves.